The Ghost Optical Illusion was uploaded by one of your viewers. I’m not sure who exactly uploaded it but if it was you be sure to comment and give some more into on it! If you look at the smoke around the girls you may think its cigarette smoke or breath in the cold air, I don’t really know for sure. 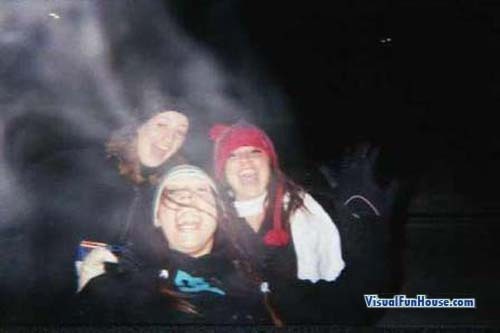 If you look closely behind the girls you will notice a very distinct figure of a man behind them.. Is there a ghostly presence sneaking into to this photograph or is it just some optical illusion thats all up in smoke! What do you guys thing? Do you believe in the super natural? I am OK,I gueese…Stop staring at me!